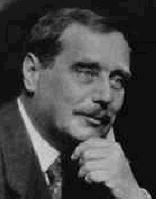 Herbert George Wells was born in Bromley, Kent. His father was a shopkeeper and a professional cricketer until he broke his leg. In his early childhood Wells developed a love for literature. His mother served from time to time as a housekeeper at the nearby estate of Uppark, and young Herbert studied books in the library secretly. When his father's business failed, Wells was apprenticed like his brothers to a draper. He spent the years between 1880 and 1883 in Windsor and Southsea and later recorded them in Kipps (1905). In the story Arthur Kipps is raised by his aunt and uncle. Kipps is also apprenticed to a draper. After learning that he has been left a fortune, Kipps enters the upper-class society, which Wells describes with sharp social criticism. In 1883 Wells became a teacher/pupil at Midhurst Grammar School. He obtained a scholarship to the Normal School of Science in London and studied there biology under T.H. Huxley. However, his interest faltered, and in 1887 he left without a degree. He taught in private schools for four years, not taking his B.S. degree until 1890. The next year he settled in London, married his cousin Isabel, and continued his career as a teacher in a correspondence college. From 1893 Wells became a full-time writer. Wells left Isabel for one of his brightest students, Amy Catherine, whom he married in 1895. As a novelist Wells made his debut with The Time Machine, a parody of English class division. The narrator is Hillyer, who discusses his theories of time travel with his friends. A week later their host has an incredible story to tell - he has returned from the year 802701. The Time Traveler had found two people: the Eloi, weak and little, who live above ground in a seemingly Edenic paradise, and the Morlocks, bestial creatures that live below ground, who eat the Eloi. The Traveler's beautiful friend Weena is killed, he flees into the far future, where he encounters "crab-like creatures" and things "like a huge white butterfly", that have taken over the planet. In the year 30,000,000 he finds lichens, blood-red sea and a creature with tentacles. He returns horrified back to the present. Much of the realistic atmosphere of the story was achieved by carefully studied technical details. The basic principles of the machine contained materials regarding time as the fourth dimension - years later Albert Einstein published his theory of the four dimensional continuum of space-time. The Time Machine was followed by The Island of Dr. Moreau (1896), a book in which a mad scientist transforms animals into human creatures. The story is told in flashback by a man named Prendick. He travels with a biologist to a remote island, which is controlled by Dr. Moreau. In his laboratory he experiments with animals and has created Beast People. Moreau is killed by Puma-Woman. Prendick escapes from the island and returns to London. He concludes the tale: "Even then it seemed that I, too, was not a reasonable creature, but only an animal tormented with some strange disorder in its brain, that sent it to wander alone, like as sheep stricken with the gid." Wells, who was a Darwinist, did not reject the evolutionary theory but attacked optimists and warned that human progress is not inevitable. In film versions the character of Dr. Moreau has inspired such actors as Charles Laughton, Burt Lancaster, and Marlon Brando. The Invisible Man (1897) was a Faustian story of a scientist who has tampered with nature in pursuit of superhuman powers, and The War of the Worlds (1898), a novel of an invasion of Martians. The story appeared at a time when Schiaparell's discovery of Martian "canals" Percival Lowell's book Mars (1895) arose speculations that there could be life on the Red Planet. The narrator is an unnamed "philosophical writer" who tells about events that happened six years earlier. Martian cylinders land on earth outside London and the invaders, who have a "roundish bulk with tentacles," start to vaporize humans. The Martians build walking tripods which ruin towns. Panic spreads, London is evacuated. Martians release poisonous black smoke. However, Martians are slain "by the humblest things that God, in his wisdom, has put on this earth." In 1930 Paramount offered the story to the Soviet director Sergei Eisenstein, but he never attempted an adaptation. Its later Hollywood version from 1953 reflected Cold War attitudes. The First Men on the Moon (1901) was prophetic description of the methodology of space flight, and The War in the AirR (1908) foresaw the importance of air forces in combat. Although Wells' novels were highly entertaining, he also tried to arouse debate about the future of the mankind. Dissatisfied with his literary work, Wells moved into the novel genre with Love and Mr. Lewisham (1900). Kipps strengthened Wells' reputation as a serous writer. He also published critical pamphlets attacking the Victorian social order, among them Anticipations (1901), Mankind in the Marking (1903), and A Modern Utopia (1905). In The History of Mr. Polly (1909) Wells returned to vanished England. Passionate concern for society led Wells to join the socialist Fabian Society in London in 1903. It advocated a fairer society by planning for a gradual system of reforms. However, he soon quarreled with the society's leaders, among them George Bernard Shaw. This experience was basis for his novel The New Machiavelli (1911), which portrayed the noted Fabians. At the outbreak of war in 1914, Wells was involved in a love affair with a young journalist, Rebecca West, twenty-six years his junior. West and Wells called themselves "panther" and "jaguar". Their son Anthony West later wrote about their difficult relationship in Aspects of a Life (1984). In his novels Wells used his two wives, Amber Reeves, Rebecca West, Odette Keun, and all the passing mistresses as models for his characters. "I was never a great amorist," Wells wrote in Experiment in Autobiography (1934) "though I have loved several people very deeply." Rebecca West became a famous author and married a wealthy banker, Henry Andrews, who had business interests in Germany. Elizabeth von Arnim dismissed Wells, and Moura Budberg, Maxim Gorky's former mistress, refused to marry him or even be faithful. After WW I Wells published several non-fiction works, among them The Outline of History (1920), The Science of Life (1929-39), written in collaboration with Sir Julian Huxley and George Philip Wells, and Experiment in Autobiography (1934). By this time Wells had gained the status as a popular celebrity, and he continued to write prolifically. In 1917 he was a member of Research Committee for the League of Nations and published several books about the world organization. Although Wells had many reservations about the Soviet system, he understood the broad aims of the Russian Revolution and had in 1920 a fairly amiable meeting with Lenin. In the early 1920's Wells was a labour candidate for Parliament. Between the years 1924 and 1933 Wells lived mainly in France. From 1934 to 1946 he was the International president of PEN. In 1934 he had discussions with both Stalin, who left him disillusioned, and Roosevelt, trying to recruit them without success to his world-saving schemes. Wells was convinced that Western socialists cannot compromise with Communism, and that the best hope for the future lay in Washington. Also one of his mistresses, Moura Budberg, turned out to be a Soviet agent. In The Holy Terror (1939) Wells studied the psychological development of a modern dictator exemplified in the careers of Stalin, Mussolini, and Hitler. Orson Wells' Mercury Theater radio broadcast, based on The War of the Worlds, caused a panic in the Eastern United States on October 30, 1938. In Newark, New Jersey, all the occupants of a block of flats left their homes with wet towels round their heads and in Harlem a congregation fell to its knees. Wells, who first considered the show silly, was shaken by the panic he had unleashed and promised that he would never do anything like it again. Later Wells attempted to claim authorship for the script, but it was written by Howard Koch, whose inside story of the whole episode, The Panic Broadcast; Portrait of An Event, appeared in 1970. Wells himself was not amused with the radio play. He met the young director in 1940 at a San Antonio radio station, but was at that time mellowed and advertised Wells next film, Citizen Kane. Story of a man who travels to an island where he finds a doctor using humans as experiments, turning them into animals. A scientist discovers the secret to time travel, adventuring far into the future and witnessing the demise of mankind. Fictional story that includes the invention of the airplane and the coming of World War I.
Martians invade Earth after Mars becomes uninhabitable.